During the month of May, people took to the streets over the high cost of living in New Caledonia. Food is 65% more expensive here than in Europe and on the whole, we pay prices 34% higher than in France. This is a statistic I quote often, because it says a lot. Just to give you a sense, you can expect to pay 8 euros for cheese and 40 euros for a bottle of champagne. You will pay 15 euros for a children’s book and 654 euros on an iPad 4. The high cost of living is not a new shock for us now. But today’s lunch, well, that’s a different story. We took a friend out to lunch at a local restaurant to celebrate Father’s Day and to catch up. We were 3 adults and 1 child (with a child’s menu). We splurged and got a bottle of wine, and desserts for everyone, with coffee at the end. 2 steaks and a plate full of shrimp as the mains. A good meal, a celebration of sorts. You can see the total charged to my card: 313,530 XPF. When you’re not familiar with the currency, it’s hard to know if we’re good. What does 313,530 mean, in the grand scheme of things? 2,627 euros is what it means (USD 3,506). That’s at least a round-trip ticket to Paris, my friends, and the hotel to boot! 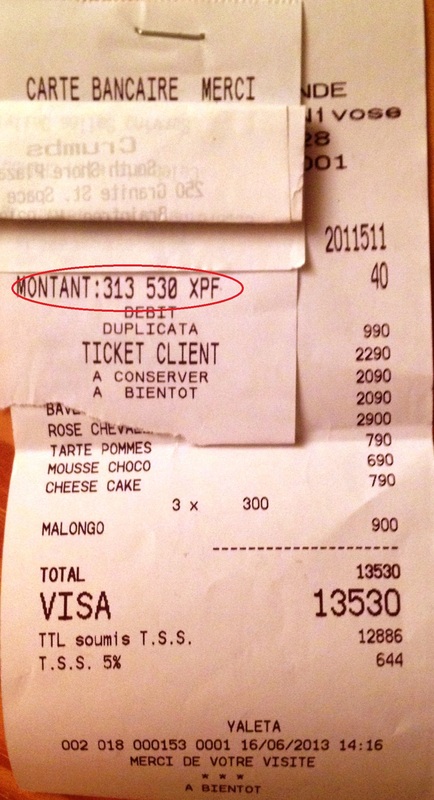 As you can see from the receipt (which I pulled out of my wallet), lunch was supposed to cost 13,530 XPF (or 113 euros). So we were overcharged a mere 2,514 euros, that’s all. It’s an easy mistake to make. A 3 was tapped in front of the 13,530. The cashier let out a small scream when I pointed out the discrepancy (which I may not have seen, if I had just put the receipt away) and called for her manager. After a bit of running around and a few disappearances, the manager came back and told me they had the wrong card to cancel the transaction. So they couldn’t cancel it. Could I come back tomorrow at 8am? Would I mind? Deep breath. What else can you do? It’s a Sunday. They don’t have the card. They can’t get the card. You live up the street. You’re not leaving on a cruise ship this afternoon. You can come back. Tomorrow. This is life in New Caledonia. Tomorrow. So I’ll be back tomorrow, but in the meantime, a warning to locals and tourists alike. Mistakes are easy to make, and are often far from intentional. But be careful. This is not the first time this has happened. And it’s not likely to be the last. Reblogged this on Down Under News. Follow up to this post: I have now, today, Friday (21 June), been reimbursed for this lunch by the restaurant. On Monday, when I went to follow up, I was told that “nothing could be done” and that “next time you should check the amount”. This, from the director of the restaurant. I am happy that it has been solved, though I do have concerns about the director’s initial response and the time it took to solve the problem. What is education like in New Caledonia?